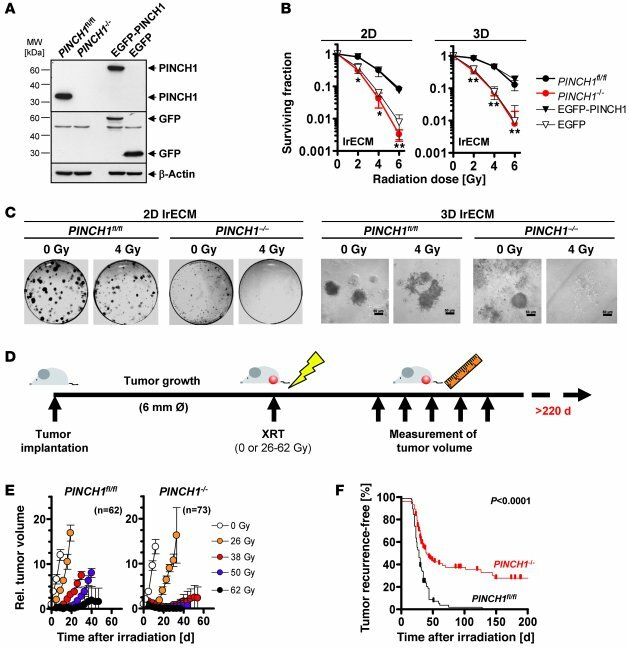 PINCH1 determines cellular sensitivity to ionizing radiation in vitro and in vivo. (A) Western blot analysis of PINCH1, EGFP-PINCH1, and EGFP expression in MEFs. β-Actin served as loading control. (B) Mean ± SD results from 2D or 3D clonogenic survival assays of nonirradiated or irradiated (0–6 Gy X-rays) lrECM cell cultures (n = 3; *P < 0.05, **P < 0.01, t test). (C) Representative images of 2D and 3D lrECM colony formation of nonirradiated or irradiated PINCH1fl/fl and PINCH1–/– MEF cultures at 11 days after plating. Scale bars: 50 μm. (D) Experimental in vivo setup. Subcutaneous allograft PINCH1fl/fl and PINCH1–/– tumors were grown in immunocompromised mice. After tumor formation (diameter approximately 6 mm), tumors were locally irradiated with increasing single doses of 26–62 Gy under homogeneous hypoxia (200 kV X-rays, 0.5 mm copper filter, dose rate approximately 1.3 Gy/min). Tumor volume was measured over a time period of 210 days after irradiation. (E and F) Volume of PINCH1fl/fl and PINCH1–/– allograft tumors in immunocompromised mice plotted against time after irradiation (mean ± SEM; n = 10–18 per group), and tumor recurrence–free survival of PINCH1fl/fl and PINCH1–/– tumor-bearing mice (Kaplan-Meier statistics and log-rank test) after irradiation (see also Supplemental Figure 3).